Filtering liquids or air in hostile environments—such as those subject to temperature extremes, high orders of shock/vibration, and caustic fuels or fumes—has posed problems for paper filter elements. These types of elements simply will not withstand these types of operating conditions. 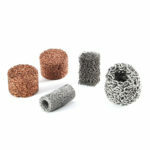 Sintered metal filters—due to their granular construction—are also prone to fracture or disintegration when subjected to the stresses of high temperature and shock. Unless the fusion process involved in their construction is 100% complete, small particles may begin to break away. As a result, when installed on either rotating or reciprocating machinery, little particles of filter material very frequently detach and migrate to block the very devices the filter was designed to protect. Metal Textiles knitted wire mesh liquid and air filters overcome the limitations and deficiencies of these and many other filtration methods. Where resistance to degradation, corrosion, mechanical, or thermal shock is desired—and where a resilient product is needed for proper cavity fit—Metal Textiles filters provide an economical, robust alternative. From cryogenic operating conditions up to temperatures of 650° C, knitted wire mesh filters maintain their integrity even when subjected to extremely high vibration and exposed to destructive gases such H2, SO4, and HNO3. In addition, each loop acts as a small spring when subjected to compressive stress. 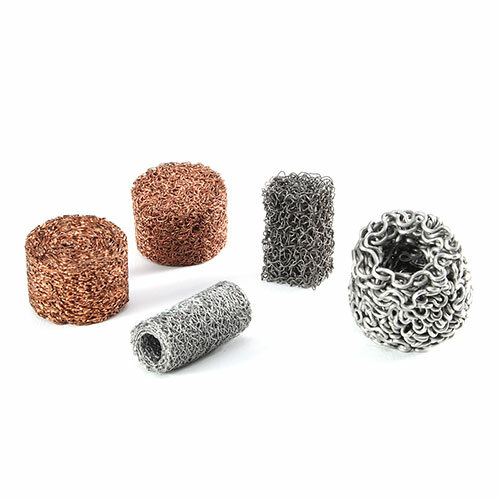 Thus, filters of compressed knitted metal mesh yield when subject to the stresses of shock and vibration—yet, depending on the construction, can immediately recover to 90% of their original size when the force is removed. Knitted mesh is also versatile. It can be made from any metallic, nonmetallic, or combination of metallic and nonmetallic materials that can be drawn into wire. By careful selection of the combination of materials, proper filtration can be provided in corrosive atmospheres, ultra-high and cryogenic temperatures, as well as for radioactively-contaminated dust particles, oil, or other extreme operating conditions.